"If I am not Ulysses, I am / his dear, ruthless half-brother." 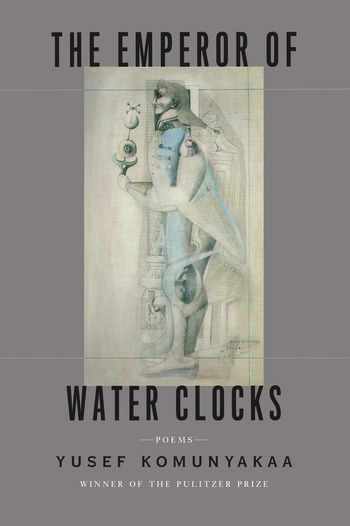 So announces Yusef Komunyakaa early in his lush new collection, The Emperor of Water Clocks. But Ulysses (or his half brother) is but one of the beguiling guises Komunyakaa dons over the course of this densely lyrical book. Here his speaker observes a doomed court jester; here he is with Napoleon, as the emperor "tells the doctor to cut out his heart / & send it to the empress, Marie-Louise"; here he is at the circus, observing as "The strong man presses six hundred pounds, / his muscles flexed for the woman / whose T-shirt says, these guns are loaded"; and here is just a man, placing "a few red anemones / & a sheaf of wheat" on Mahmoud Darwish's grave, reflecting on why "I'd rather die a poet / than a warrior." Through these mutations and migrations and permutations and peregrinations there are constants: Komunyakaa's jazz-inflected rhythms; his effortlessly surreal images; his celebration of natural beauty and of love. There is also his insistent inquiry into the structures and struggles of power: not only of, say, king against jester but of man against his own desire and of the present against the pernicious influence of the past. Another brilliant collection from the man David Wojahn has called one of our "most significant and individual voices," The Emperor of Water Clocks delights, challenges, and satisfies. Yusef Komunyakaa's books of poetry include Neon Vernacular (for which he received the Pulitzer Prize), Talking Dirty to the Gods, Taboo, Warhorses, The Chameleon Couch, and Testimony: A Tribute to Charlie Parker. His plays, performance art, and libretti have been performed internationally and include Wakonda's Dream, Saturnalia, Testimony, and Gilgamesh (a verse play). He teaches at New York University.